Abstract: Microsoft comes into the picture with a very interesting mouse that works with out the ball. Ball-less mouse tech. What could be better? So you might be 'pimpin' along with a PIII 1Ghz - Geforce2 super PC, but there's more to a PC than a fast processor, loads of RAM, or a large hard-drive. External peripherals make a big difference too! While a good mousepad, such as the Everglide LAP, can perform small miracles with just about any cheap mouse, there is always room for improvement. Of course this is where Microsoft comes into the picture with a very interesting mouse. 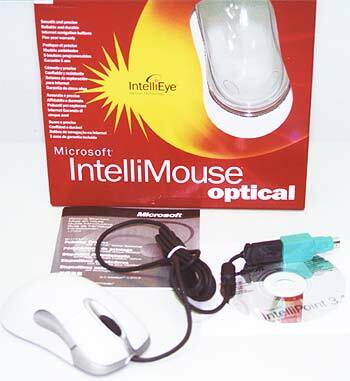 While there are many ball-mice to choose from, Microsoft's Intellimouse Optical does stray quite a bit away from the standard fare. Rather than using the old ball mechanisms of old, Microsoft has replaced these parts - the ball rotar and little wheels that always seem to get clogged with dust, and unknown sticky stuff with just this: A roller wheel (working on the exact same principle as the old roller ball did), an LED pointing out the back to let you know when the mouse is on, another LED to bounce a red light off the mouse surface and give the CMOS camera something to read, several little buttons and assorted circuitry. Pg 2. So, what goes in it? Pg 3. Special Features... cool! Pg 4. But how does it perform?